When Sal Cribari chats with customers and acquaintances about his restaurant, he’s often asked about the significance behind the name. As the name implies, Fradillio’s sells hot dogs – nearly 4,000 Chicago-style, chili and corn dogs per week – but that’s just the beginning. The menu includes Italian beef sandwiches, fresh burgers, turkey wraps, a variety of chopped salads and the always popular pita gyros, of which Fradillio’s sells nearly 600 each week. Pastas, chicken sandwiches and plenty of desserts round out the offerings. 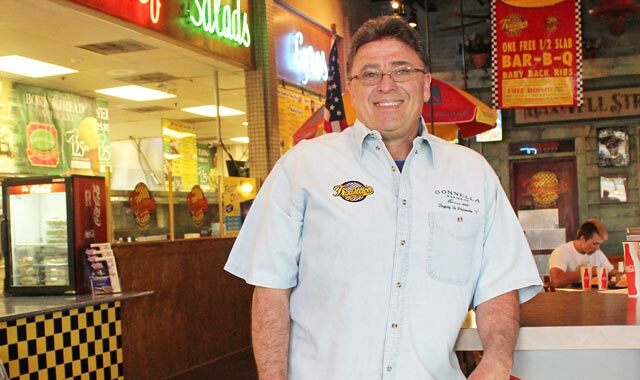 Cribari started in the restaurant business in 1979, when he opened Frato’s Hot Dogs in Schaumburg. Eight years later, in 1987, he sold it and opened his first Fradillio’s in Elk Grove Village. When Cribari built a new home in Lake in the Hills more than a decade later, he decided to sell his business and build a new 5,000- square-foot Fradillio’s closer to home. He opened it in June 1999. In addition to serving customers at the restaurant, Fradillio’s caters events small and large – birthday parties, graduations, baby showers, holiday celebrations. “Pasta trays, Italian beef by the pound, meatballs and dog and fry trays are popular for all occasions,” Cribari says. Cribari’s three children – sons Michael and Phillip, and daughter Jamie Lynn – all work part-time for their father. Cribari even named a dessert, Jamie Lynn’s Soon to be Famous Chocolate Cake, after his youngest child. “I’m proud of all my kids,” he says. In addition to large flat-screen televisions and many interesting photos, the unique décor includes actual bumper cars salvaged from Chicago’s historic Riverview Park, which was open from 1904 to 1967. “It’s all part of that all-American look,” Cribari says. Fradillio’s is open Monday through Saturday, 10:30 a.m. to 10 p.m., and Sunday until 9 p.m. This entry was posted on Wednesday, June 27th, 2012 at 12:00 pm	and is filed under Dining Guide, Top Posts. You can follow any responses to this entry through the RSS 2.0 feed. Both comments and pings are currently closed.